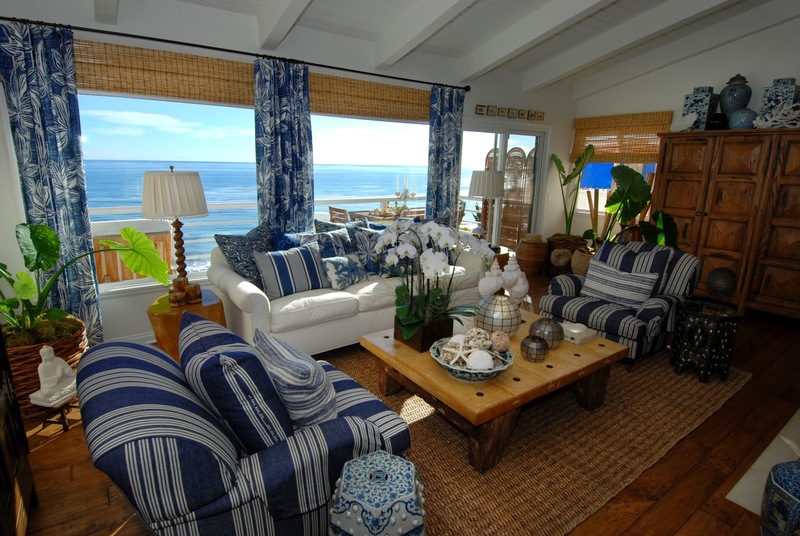 How can you go wrong decorating with blue and white in a beach house? Mixing stripes, florals, seashells - the possibilities are endless! It's also a style that can look "beachy" with out being obvious, simply remember to use a little restraint, and edit, edit, edit. A room full of collected treasures mixed with crisp denim blue stripes, and natural elements of white seashells and a classic sisal area rug screams "coastal", and I think can be very welcoming. Not so sure that I would have that many things on my coffee table, I really need a spot for books and my coffee cup, but I do like the blue and white pottery bowl full of mosaic seashell balls. 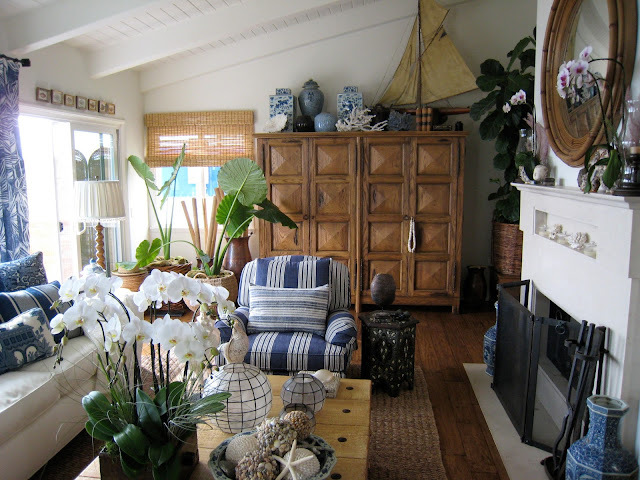 And a beach room can always use a vintage model sailboat! Using the same denim blue and white striped upholstery fabric on the dining room chairs does a good job of tying the two rooms together. It also gives the dining room a more casual inviting feel. 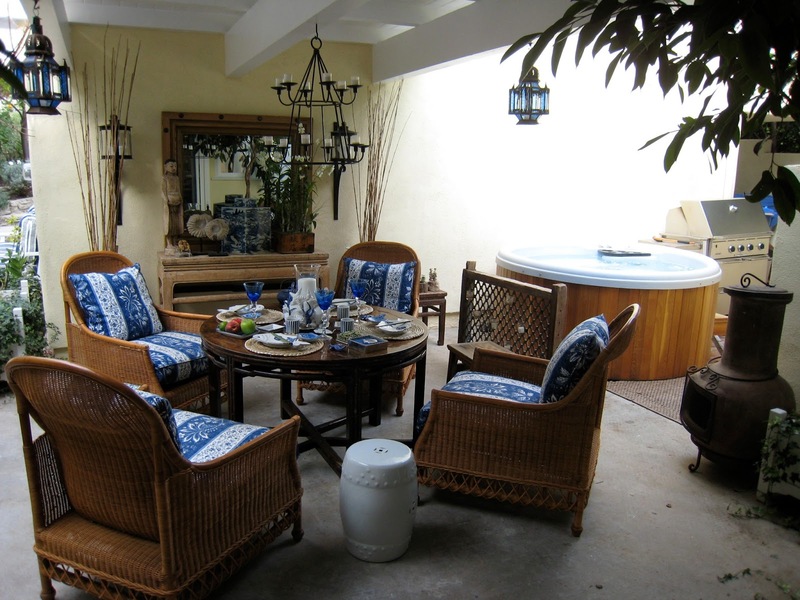 Love that round bamboo mirror - very British Colonial! Totally decadent and totally Southern California - can't you just imagine having a dinner party beside the sea with your very own outdoor fireplace? I think the hanging candle fixtures and blue glass Moroccan style lanterns just add that extra special element. Or maybe we should dine out here with a gorgeous Pacific Ocean sunset? The tiny shell covered candelabra is a very nice touch! 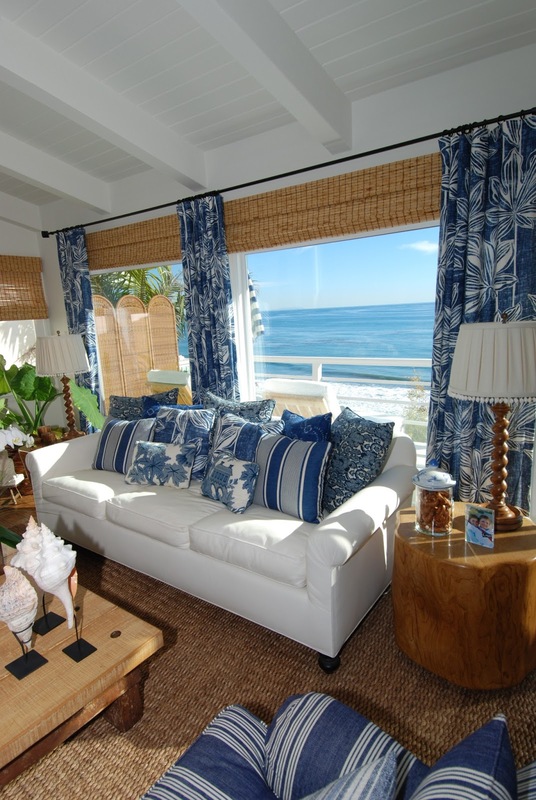 You can see all of the interior portfolio shots of this gorgeous Malibu Beach home on Barbara Grushow's site - Barbara Grushow Design. Lovely work. Reminds me a little of Barclay Butera's style, but a little less formal. Love the living room! But it's a bit over decorated for my taste. Would definitely remove a few things. Agree with you on the table. Need space to put things there! 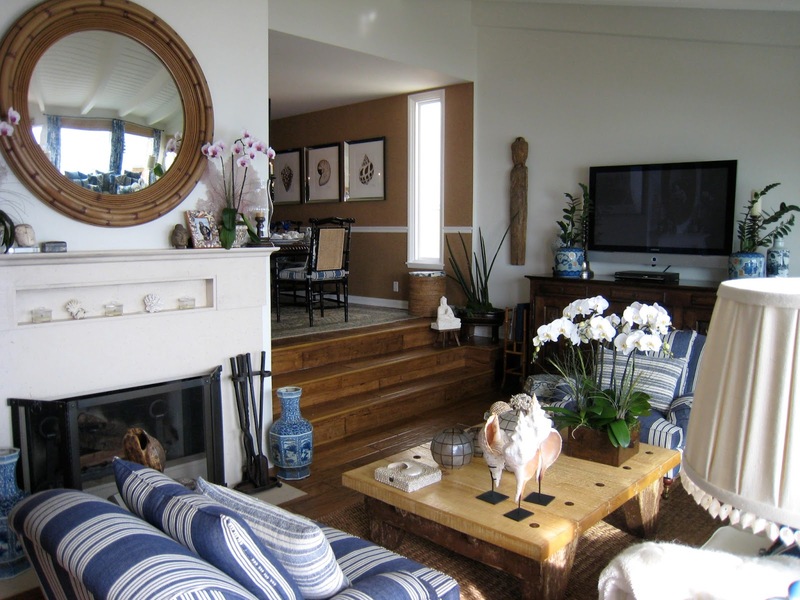 "Green" Coastal Living Decor Fabulousness! Coastal Lifestyle - A Career in Flip Flops?